Welcome back to another edition of Sunday Night Thoughts. It’s been a great week here in the Argot house – kind of a crazy week as well. We got our first snow and it was quite a bit of measurable snow. I don’t think I would have ever thought of a White Thanksgiving happening in the Shenandoah Valley and yet – that is what we had. We had about 4 to 5 inches of wet, sticky snow. This thanksgiving was quiet with just Pam, I and the two kids. Anna had to work the afternoon of Thanksgiving Day, and yet there was a problem. Seems a water main broke just down from the Cracker Barrel and they had no water for the entire day. We took her to work at 4 and she came home at 5:30. They were really hopeful they could open for at least a portion of the day. On Wednesday we had the 4 to 5 inches of snow. We spent Tuesday getting ready. I put up the driveway guides and found out what a linchpin was while trying to make sure the snowblower was ready. Here’s the link to that story. Like I said, the snow was heavy, wet, and sticky, which made it difficult to snowblow. It kept wanting to jam up the snowblower. Friday was a work day for me. I helped open the store. All seemed well – and I knew it was going to be a busy day. Afterall, school was out and it was Black Friday. Little did I know that there was a University of Virginia / Virginia Tech football game that night in Blacksburg. We got slammed…by the end of the day you could stick a fork in me because I was done. Saturday, I was finally able to get in another quality run – getting in almost 7 miles. Pam and I got our final preparation in on our sermon that we preached this morning and spend most of the rest of the day relaxing. Today we were up early and it was a good day. I lead the worship service and Pam preached the children’s sermon and we tag teamed the sermon. We preached on the importance of being alert and on guard as we took our text from Mark 13. We also taught a great song called “Waiting Here for You.” The congregation picked up on it really quick and I look forward to adding it to our repertoire. We even managed a little bit of a walk before our dessert theatre rehearsal and then we were on to children’s ministry and youth group. Like I said it has been a great week – a little crazy but a good week. I am looking forward to a more normal week. We even get to celebrate Anna’s birthday this week. Have a great week. Carp Diem! The last two weeks have just been “one of those weeks” – both of them. After a very satisfactory and fulfilling week of running that finished with a 13 miler – the weather and life caught up with me. Since that 13 miler, I have run a total of three times – the Friday afterward, this past Tuesday and today. The good thing is those runs have been encouraging – they have been somewhat fast – today’s was at an 8:34/mile pace – that’s not too bad considering the lack of mileage. I do want to try to keep up the mileage because I don’t want to have to try to put together a quick paced training to get ready for the Park to Park this Spring. That is just asking for trouble. I one point I didn’t feel like running, but I’m glad I did – it’s part of that perseverance thing. I’ve looked at the weather for the week and it looks like it will be much more cooperative this week. That’s about all I’ve got – Pressing On! Advent Begins Tomorrow – Why Is That Important? Advent Begins Tomorrow. Today Is The Last Day of the Christian Year. Should You Care? Tomorrow is the first day of Advent. In yesterday’s post, I encouraged you to get ready for Advent. Today, I want to think with you about the broader context in which Advent makes sense. Should you care about any of this? Does it really matter? Advent: We prepare to celebrate the first coming of Christ and anticipate his second coming. Christmas: We celebrate the Incarnation of the Word of God, the birth of Jesus the Savior. Epiphany: We remember the revealing of God through Christ to the whole world. Ash Wednesday: We are reminded of our great need for a Savior. Lent: We focus on the life of Jesus in preparation for Holy Week. Palm Sunday: We celebrate the triumphal entry of Christ into Jerusalem. Maundy Thursday: We remember Jesus’ foot-washing and his command to love. Good Friday: We worship Jesus who gave his life on the cross for us. Easter: We celebrate the resurrection of Jesus and the victory of God. Christ the King Sunday: We worship Jesus as King of kings and Lord of lords. If we rightly understand the Christian Year, we will see it as a way to structure our lives in light of the life, ministry, and lordship of Jesus. Mark, says it better than I can. I want to encourage you to read the full article and then join me in our church year journey. Advent is a season observed in many Western Christian churches as a time of expectant waiting and preparation for the celebration of the Nativity of Jesus at Christmas. The term is an anglicized version of the Latin word adventus, meaning “coming”. Latin adventus is the translation of the Greek word parousia, commonly used to refer to the Second Coming of Christ. For Christians, the season of Advent anticipates the coming of Christ from two different perspectives. The season offers the opportunity to share in the ancient longing for the coming of the Messiah, and to be alert for his Second Coming. 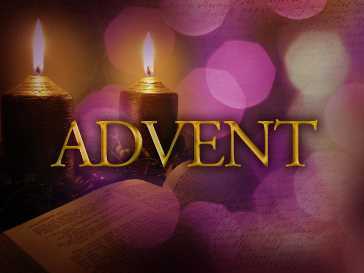 Advent is the beginning of the Western liturgical year and commences on Advent Sunday. At least in the Roman Catholic, Anglican, Lutheran, Moravian, Presbyterian and Methodist calendars, Advent starts on the fourth Sunday before December 25, which is the Sunday between November 27 and December 3 inclusive. It really is hard to believe that another church year has passed and we are on the cusp of another season of Advent. This marks the eight time we have finished the course on this blog. This year we will be following Year B in the lectionary. We started on year C in 2006. For the next three years, we followed the readings from all the weekly readings and Pam or I wrote a devotional based on all three. At the end of that cycle (a cycle being three years,) We looked at the Old Testament readings each week. Then when we finished that cycle, we started our most recent trip looking at the Psalms. When we are finished in 2015, we will have completed the Psalm cycle and will begin the Epistle cycle. As you can tell, I love the seasonal nature of the church calendar. I am looking forward to another journey through it. I really want to try to blog more this year on the scriptures. Over the last year I mainly just posted the scriptures, but hoping to get around to more devotionals this year and explanations of the church year. I always start off well, but by Easter it all falls apart. As I write this in the early morning hours – while much of the world is shopping for Black Friday deals – I am reminded what Advent is all about. My body is recovering from a day of feasting that was Thanksgiving. One of the most important things I want us to remember is that Advent is not Christmas. Advent is a season of its own – it is a season of waiting – it is a season of preparation – in the past, it was a penitential season (the Christmas version of Lent) – a solemn time – meaning it was characterized by deep sincerity. Don’t get me wrong. I love all the celebration of Christmas, We have even already been Christmas shopping…but it is so much more than a celebration….filled with lights…trees…presents. Many years ago on this blog, I wrote about a Christmas party we had at church. There would be a Christmas feast and then the congregation would share gifts with each other and with the pastoral family. One of the teens who came as part of our van ministry showed up that night and was disappointed that she didn’t get anything – she said “I only came tonight for the presents.” Isn’t that the way that most of us approach Christmas? We only do it for the presence and yet the great irony is that Christmas is all about the Incarnation – that God (in the person of Jesus) became flesh and dwelt among us…as Eugene Peterson writes in The Message, “He put skin on and moved into the neighborhood.” God desires to dwell among his people – it’s all about his presence and not about the presents. I am determined more than ever this year to make sure it is more about the presence and not about the presents. With that in mind, let’s take just a few moments to reflect on today’s passage from the Psalms. Pam and I are preaching on Sunday, but will be using the Mark passage as the basis for our sermon. We will also be reading from Isaiah during the Advent candle lighting. The psalmist reminds us that we are sheep…it seems we are reminded about that quite a bit in the scriptures. Then he asks the Shepherd to come save us…to show His mighty power. We know that we are like sheep who have gone astray – this is a prayer for God to come rescue us. As it applies to Advent – even now – we are longing for Jesus to come rescue us. He asks us to be prepared for His coming. How many were not prepared for His first coming? Not many, but we do know of a few. The very coming of God in the flesh was fulfilled in Jesus. John reminds us that Jesus is the light of the world. The psalmist finishes this psalm with a call for God to shine His light on us. We are in a world that needs light – a world that needs hope – we are a world that needs Jesus – and the world needs us to be Jesus to it. 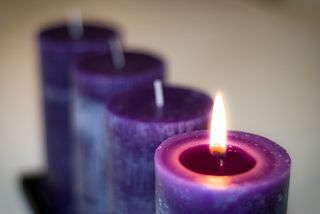 Traditionally the first candle of Advent is the candle of hope – it is also the prophet candle – Isaiah the prophet foretells the coming of Jesus – the light of the world. I love that Advent is symbolized by the candles that we light each week. It reminds us that the Light of the World is coming again. I want to encourage you this year to prepare your heart for his coming – for his advent – not only the celebration of his first advent in the celebration of Christmas, but make sure your heart is ready for his second advent. The hymnwriter Isaac Watts wrote many years ago, “Let every heart prepare him room.” Make room in your heart for Jesus.